Always a band that celebrates and respects its ancient Nordic heritage, HELHEIM has taken the story of two wolves, Hati and Skoll, for “Dualitet og Ulver”, which translated means “Duality and Wolves”. Legend has it that the two wolves tried swallow the sun and the moon, and the song uses this imagery to illustrate that there can be no light without darkness and no day without night. If either is destroyed, be it by natural catastrophe, or human actions, only primordial chaos will remain. Both are hanging by a fragile thread that can easily be torn apart by the wolf, which is one of earth’s natural predators. The duality of light and darkness must therefore be preserved and balanced not only by nature, but also my humans. 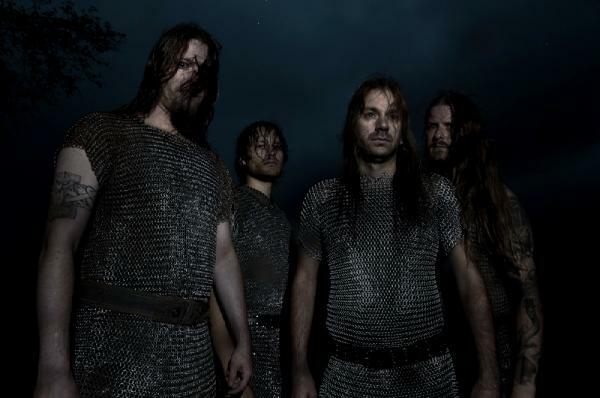 The six-track “Åsgards Fall” MCD, which was released on Dark Essence Records, contains two epic new tracks, written especially for this release, as well as a new recording of the HELLHEIM classic “Jernskogen”, originally found on the “Blod & Ild” album. “Dualitet og Ulver” itself is the video-mix of the track that will appear on the band’s forthcoming full-length release “Heiðenðomr ok Motgangr”, due out at the beginning of 2011. Recorded at the Conclave and Earshot studios in Bergen, “Åsgards Fall” was produced by HELHEIM and Bjornar Nilsen (VULTURE INDUSTRIES, BLACK HOLE GENERATOR), and was mastered by Herbrand Larsen (ENSLAVED, AUDREY HORNE).